A group of adventurers caving. Gone are the days when references to Grey Bruce’s economy conjure images of ship-filled harbours bustling with trade, or factories filled with workers manufacturing items to be shipped across the continent or beyond. There was a time that our community’s economy was much more diverse than we presently find it. The region had lucrative lumber mills, quarries, factories and farming. These days, the images that Grey Bruce inspires are not of industry, but of the exquisite scenery surrounding Georgian Bay and the Niagara Escarpment: majestic waterfalls, ancient outcroppings and crystal blue waters. Tourism is our second largest industry after agriculture and the region’s natural beauty is a fantastic resource. Businesses in our region have been marketing to tourists in different ways. Local company At Last Adventures provides adventure-based guided tours and outdoor courses to tourists, as well as locals. We spoke with them regarding their business. Tourism is our second largest industry after agriculture and the region’s natural beauty is a fantastic resource. How would you describe your specific product or service? We specialize in adventure tourism and adventure therapy; offering daily and multi-day trips that help benefit the mind, body and soul. Such trips include but may not be limited to rock climbing, kayaking, hiking, camping, and snowshoeing. As an ambassador to the Grey and Bruce outdoors we pride ourselves on creating a safe experience for both our clients and the environment. What motivated you to establish, acquire this business? In 2006, I climbed to the summit of Mount Pisco in Peru. As we made our way up the mountain ridge to hit the summit by sunrise, we were surrounded by white capped mountains illuminated by the full moon. Although deprived of oxygen and extremely fatigued something clicked. I thought about all the people I have ever met who lived with depression, anxiety, or any other ailment. If they were with me, in the moment on top of the Andes Mountain range, underneath the stars, how could they be anything but happy? I had a perma-smile for a week after the climb, which leads to very sore cheeks. It was then I knew I had to start At Last Adventures. As it stands right now, major organizations in Southern Ontario are sending people as far as Utah to access adventure therapy programs. With the rich geographical features that Grey Bruce offers, they should be sending people from Utah here! What experience do you have that has been helpful in this business? I was a Resident Assistant (RA) for three years at University, my primary job was to recognize student’s challenges and refer them to appropriate resources. During that time I earned degrees in Geography, Outdoor Recreation (specialized in Leadership), a B.ed in Experiential Education and Environmental Science. Since graduating I have worked with youth at risk in Whitehorse and southern Ontario, children with autism, and for a handful of tour companies specializing in rock climbing and caving tours. Adventurer repelling along the Niagara Escarpment. What are some the challenges you faced in getting started? The powers to be seem to be against roped activities on the Niagara Escarpment. 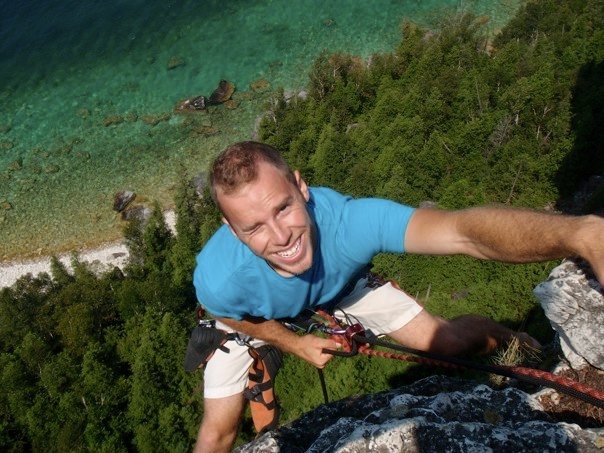 I believe it’s due to the stigma associated with climbing being dangerous, and the provincial parks and conservatories don’t want to be held liable for accidents. It is ironic, as the majority of climbing accidents happen to people that are not trained that try to go out on their own, with or without safety equipment. At least with a guiding body, safety equipment and safe practices are guaranteed. Starting a business is easy, surviving and making a business profitable is the hard part. Money and time is needed in order to succeed. Most importantly it’s who you know, and who’s talking about you that is the most important, in my business anyway. Were there people/resources that have helped you along the way? I would be lying if I said I did this all on my own. The Business Enterprise Center has a program called the Ontario Self Employment Benefit Program. It helps you get from point A (the idea) to point B (business plan, financial support, training, etc.). I owe all my success to this program. Do you have any competitors to your business? I don’t believe I have any direct competitors in southern Ontario. I have some indirect competitors like PRANCE, Pine River, Outward Bound. However I see them more like potential partners than competition. I thought about all the people I have ever met who lived with depression, anxiety, or any other ailment. If they were with me, in the moment on top of the Andes Mountain range, underneath the stars, how could they be anything but happy? How do you think you differentiate your business from other similar businesses? At Last is the only company specializing in rock climbing and caving in the Bruce county region. And although the quality of our staff and programs are great, the esthetic beauty of our geographical region is unique and cannot be compared to anywhere else in Canada. Are there challenges to being located in this community? If so, how did you overcome them or are they still an issue. Some might think an adventure tourism company up here would have to be seasonal. But we plan to hold year round programs and tours. 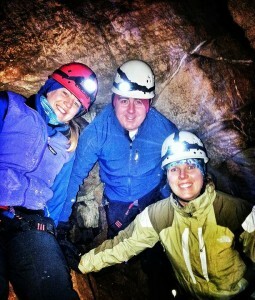 The caving tours can happen year round, and winter camping, snowshoeing, and other snow based adventures are gaining in popularity. Do you see specific challenges for the future? Yes. I am trying to open a climbing area in Owen Sound. There is a lot of work ahead of me that I must do to prove the viability of running a climbing program in town; both from an economical and environmental sense. What advice would you offer other entrepreneurs? Network, location and money are the three must haves. Ask questions, ask for help, and ask for feedback. I pride myself on being a lifelong learner, and I relish the opportunities to receive constructive feedback.